For aspiring hedgehog owners, one of the most simple, yet highly important tasks that they need to do is choosing a cage for their pet. A hedgehog’s house, as well as his living condition, will greatly affect his health, as well as the number of years that he can live. Hedgehogs that live in the wild tend to traverse 4 to 7 miles of land per night. This means that you need to provide them the largest cage that you can possibly acquire. A pet that has a lot of space to explore will be happier and healthier because they can get the adequate amount of exercise and play that they need. There are a lot of cages that you can select on the market. However, you have to be wary of choosing the right one because not all of them can effectively keep your pet safe. Here is a list of guidelines that you should follow when choosing a hedgehog cage. Hedgehog pets need to be kept in habitable cages. Bearing in mind, hedgehogs are excellent climbers, the interior part of the cages should be kept smooth. If you are considering having a hedgehog as a pet, it’s important to ensure you have the best hedgehog cage. After all, they tend to spend most of their times in a cage. Buying the best cage for a hedgehog will keep them secure, safe and well entertained. Despite the hedgehog size; and they are relatively small, they are very active and need plenty of space to move around. Remember, a good home equals a happy and healthy pet. Most ferret cages will not be sold with the idea of providing a home for a hedgehog only. This is because hedgehogs fall under the exotic animal category. This makes it hard to find pet stores that cater to clienteles who keep hedgehogs as pets. However, cages that provide habitat for other small animals can be used to provide a habitat for a hedgehog with little modification. Some of this may fall under the container category. What matters most, however, is whether the chosen container or cage provides comfort and safety for your pet. Seeing that hedgehogs are mostly confined to their cages, the cages need to be at least 4 feet long and 2 feet wide. This allows them ample room and space to move around. Most common hedgehog cages are either made of wire cages or plastic storage containers. Deciding on the cage to choose is one of crucial decision you will have to make. A hedgehog’s habitat determines its longevity and quality of life. One important question you need to ask yourself is what kind of cage is best for a hedgehog. There are different types of cages that you can choose from. There are plenty of hedgehog cages for sale in the market. This review has factored in all the factors discussed above on what to look for. However, these cages might not be inclusive of bedding, and you would need to factor this into your budget. You will probably need to do your research on the best bedding for hedgehog cage on the market. 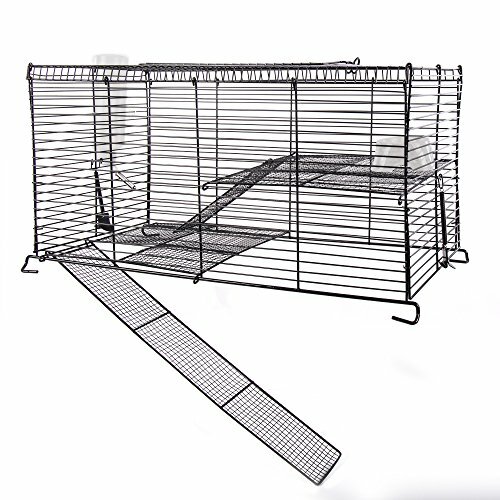 Below are some cages for hedgehogs that are available in the market that you can consider. It’s important to invest in big hedgehog cages that are of good quality. This will last you longer before you’d want to replace it. Which Cages Do Our Experts Prefer? Converts any 10 gallon aquarium to a small pet high rise! Ware Manufacturing Chew Proof High Rise Pet Cage for Small Pets provides an ideal home for your hedgehog. It converts any 10-gallon aquarium to a multi-level home for pets. With a well-ventilated fresh air design, it comes with spring locks, ramps, and safe mesh floors. It’s made of durable powder coated wire that is chew proof to your pet. Cleaning this cage is made easy with its rooftop door. The 3-Floor design offers enough space for your pet to move around. If you are on a budget, this cage is cheaper as compared to other cages on this review. The Kaytee My First Home Tank Topper converts any 10-gallon tank into a multi-level high rise for your pet. It’s made using chew proof coated wire and stain-resistant plastic. It has comfort shelves, food dish, water bottle, safety ramps and a little brick house hideout. The length, width, and height for this cage is 20 inches, 10 inches, and 10 inches respectively. 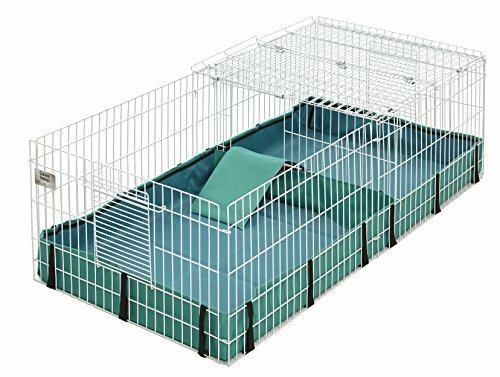 The Midwest Guinea Habitat is a cage that you should consider for your hedgehog. This is no ordinary cage and is recommended by veterinarians and breeders. It has 8 square feet of space that can easily be expanded with a simple addition of another Guinea Habitat. It’s designed to keep your pet healthy and well adjusted. 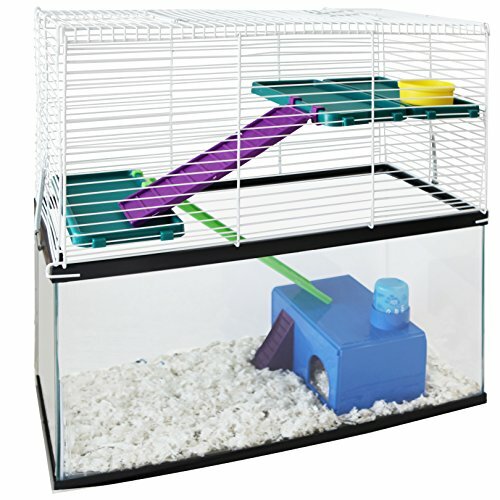 The ample space allows you to clean up the cage and interact with your pet easily. It has a fully removable wire mesh top that offers protection for your pet. The cage has a separate play and care area that’s divided by ramps. The floor is PVC lined which gives it durability and is leak proof and comes with a one year warranty. 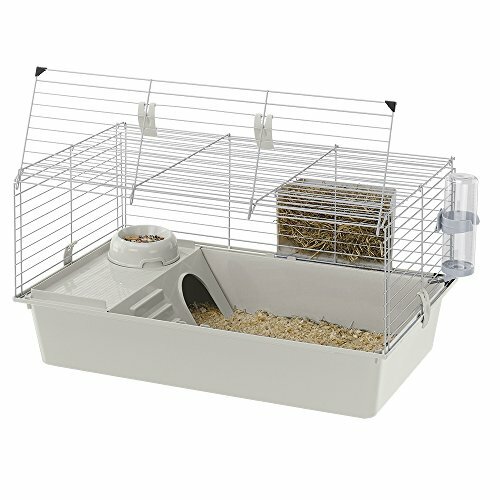 Ferplast Pig Cage, Grey has a wire net structure and a plastic base. Besides its removable base making it an easy cage to clean, its front door can be completely opened making it easy to maintain. The cage comes complete with a hay feeder, drinking bottle, bowl and comfortable house for sleeping. Its closing system is designed to keep your pet safe and secure. The cage can easily be dismantled. However, when purchasing the Ferplast Pig Cage, you need to consider whether you have a big hedgehog or small one. It’s important to choose a model that’s in compliance with your hedgehog size. Living World Deluxe Habitat is a product of Living World who are rated as the number one best sellers for small animal cages. This habitat provides everything you need to keep your hedgehog safe. This hybrid cage, consists of an upper wire frame and a plastic bottom base. 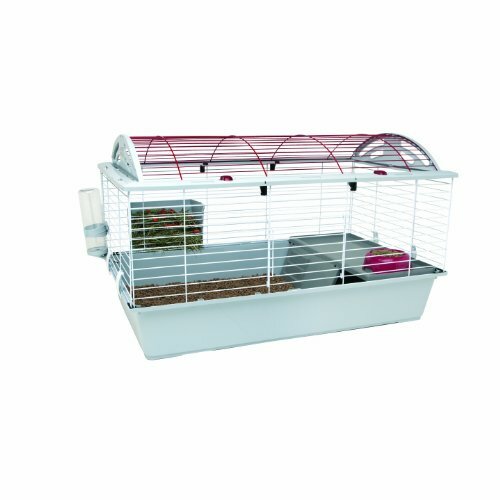 It provides a safe, comfortable and well-ventilated habitat place for small pets. It has a balcony with an access ramp and a tip-proof food dish that secures to the balcony floor. With this cage, your pet has a hideaway space under the balcony. This gives it a quiet and secure hiding place. In addition, it comes with a drip-proof water bottle and a hay guard. Both are located outside to save on space and allow for easy maintenance of the cage. The Living World Deluxe Habitat is a DIY hedgehog cage that can be assembled in minutes without the use of any tools. It’s available in three different sizes; Standard, Large and X-Large. The length, width, and height of this cage are 46-8/9-inch, 22-4/5-inch and 24-inch respectively. 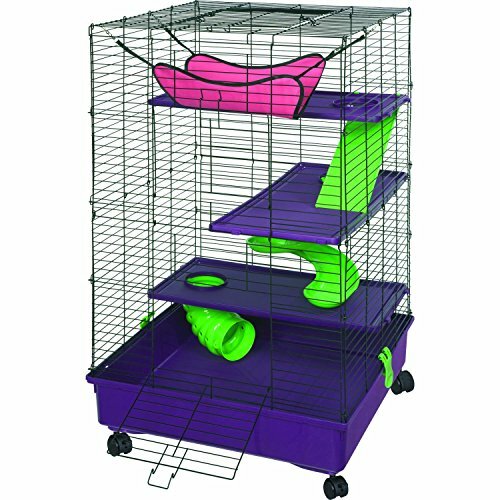 Kaytee My First Home Deluxe Multi-Level Pet Home with Casters provides your hedgehog with a safe, creative multi-level spacing. This allows it to play and move around. It has been designed with chew proof coated wire and stain resistant plastic parts. The base can be easily removed and replaced easily. With this cage, your hedgehog cage setup is as easy as a snap-together assembly that will not require any additional tools. Its features include a deep plastic base, solid safety ramps, hammocks, ferret rail fun-net, extreme spiral slide and three comfort shelves. Plus, every home includes an e-z roll stand with deluxe caster wheels. Now this, is the ultimate habitat for your hedgehog. Designed to keep your pet happy and healthy, while providing you with accessibility and easy cleaning. 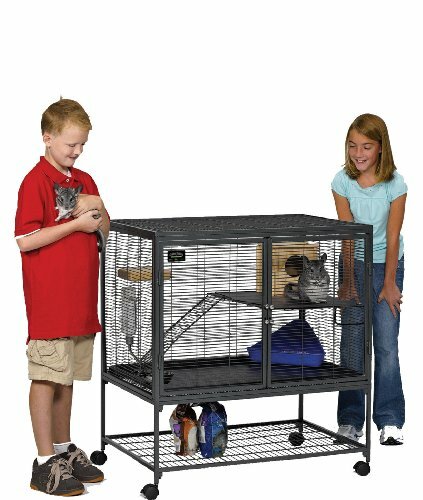 The Critter Nation cage comes equipped with one ramp and one ramp cover, one resting shelf and one easy to remove base pan for easy cleaning. The full-width double doors provide maximum accessibility when cleaning or feeding the hedgehog. Its half inch horizontal wire spacing allows your pet to climb and explore in a secure environment freely. The wide expansive shelf and full-width plastic pan floor offer enough play area and help prevent dangerous falls. Besides the easily removable height adjustable shelves with removable tray making it easy to clean, they also make the habitat less messy. Your hedgehog’s feet will be protected by the happy feet ramp cover that provides traction and no-slip passage between levels. The Critter Nation includes a Critter-proof dual-locking door latch that provides a secure, easy one-handed operation. If you are looking for hedgehog cage ideas, you definitely need to consider the Critter Nation. Check out how this pretty girl is setting up a cage for her pet hedgehog. ​Hedgehogs have an extremely keen sense of smell. It is important to select a cage that has a well-designed ventilation system so that your pet will not be forced to constantly smell his urine and feces. Plastic cages with a wire top are expensive, yet excellent hedgehog homes. The wire frames prevent the scent of the urine and feces from being confined inside the cage. ​If you prefer plastic tubs over wire cages, you can fix its ventilation system by poking additional holes in the container’s top. If you wanted to place your pet inside a ﻿Vivarium﻿, make sure that you add extra gaps in the container because its Plexiglass window prevents any air from escaping the cage. ​Plastic cages with a wire top are one of the most common hedgehog houses that you can see on the market. If you are planning to purchase this container, make sure that its wire spacing is 1 inch or less. Keep in mind that these are very small creatures. If the cages’ wire frames have a large gap between them, your pet might escape. Or worse, its head might get stuck in one of those spaces. ​Hedgehog cages should always be placed in a warm and relaxed environment. Make sure that their living quarters are free from any drafts and they are not exposed directly to sunlight. ​These pets prefer to live in warmer temperatures that are somewhere between 75 to 80 degrees Fahrenheit. Keep this temperature constant, and never let it drop below 65 degrees Fahrenheit. A colder room temperature will force your pet to undergo a false hibernation phase. False hibernation is a process wherein an animal undergoes a state of deep sleep without acquiring the sufficient fat supplies and nutrients first. Once they enter this state, it will be very hard to wake them up. Most hedgehogs die during this false hibernation phase because of lack of nutrition. ​In addition, a colder temperature can also provide stress to your pet. They become less active, and their eating habits slow down at an alarming rate. Malnutrition and lack of exercise can cause serious health risks to your hedgehogs, so make sure that their living environment follows the recommended temperature levels. These containers have a solid floor boards and a deep pan. Their metallic wire frames make the entire cage well ventilated. In addition, you can easily increase its temperature using a ceramic heating device. Wire cages are very ideal dwelling places for land animals because they provide a larger floor space compared to other variants of pet containers. Their metallic frames also make it durable enough to protect the animals from children and larger animals. They have extremely deep bottoms that can reach up to six inches in height. This prevents your pet from easily escaping its container. You can choose between a plastic or metal variant. However, most hedgehog owners prefer the plastic type because they are easier to clean and they never rust. They are also lightweight compared to its metal counterpart. As mentioned earlier, they are the most popular type of hedgehog cages because they are cheap and can be purchased across numerous pet stores. Thanks to their lightweight frame, they are also very easy to transport from one place to another. This cage is ideal for neophyte hedgehog owners because cleaning and disinfecting it is such a breeze. However, make sure that you choose a heating device that is appropriate for this container. Because of their plastic frame, a strong heat lamp can easily melt it. A plastic inflatable pool can also be converted into a hedgehog cage. Because of its enormous size, your pet will surely have an enjoyable time traversing it. However, the biggest disadvantage of a wading pool is that it does not have any enclosures, making it easier for your pet to escape. Never place and toy and accessory that is high enough to help your pet reach the top of the cage. There are numerous variants of hedgehog cages. However, not all of them are effective at keeping your pet safe, healthy, and happy. These guidelines will provide you some of the pitfalls that you should avoid when choosing a new container for your little pet. Good for other pets such as ferrets, multi-level cages are dangerous to hedgehogs. Some pet owners prefer a multi-level cage because it saves up on space. However, these pet containers pose serious risks to your hedgehogs. Hedgehogs have the ability to climb. Unfortunately, they are not adept at descending to lower ground. Their short toes prevent them from grasping or holding onto objects. Once they drop, they do not have any means to prevent the impact of their fall. On the other hand, their legs are utterly small compared to their large and round body. This makes it difficult for them to resist the gravitational forces of the earth. In addition, shorter legs also mean that their body will absorb most of the fall’s impact, causing more damage to their bones and internal organs. If you really wanted to keep a hedgehog, the most ideal cage for him is a container that has vast floor space filled with accessories and toys. But if you really want to hone their climbing skills, you can buy little climbing toys that have ridges where they can place their feet. These accessories are only a few inches off the ground, so you can ensure that the animals are still safe even when they fall down. Wire floors are a big no-no when it comes to hedgehog cages. Their tiny feet might get stuck in these wires. If they force themselves to escape, their feet will be greatly injured. Usually, most pet owners tend to use an aquarium with a 30 gallon water capacity to keep their pet hedgehog. Although it provides adequate space for exercise and play, it is still not an ideal home for your pet. These containers are only suitable for fishes and small reptiles. Its thick, glass frame cannot ventilate the air properly and will definitely trap the scent of your pet’s waste. The aquarium’s wide mouth will make it easier for your hedgehog to escape. If you try to cover its top with a wire mesh, very little air can enter or escape the cage, making it a dangerous living environment for your pet. Aquariums are also more expensive compared to the traditional hedgehog cages. The larger the aquarium, the more money you have to spend. They are also heavier and more difficult to transport. Cleaning them can also be a very daunting task. If you are not careful enough, its glass frame might break apart. If you have other pets and little children who are very active, avoid using a large aquarium so that they will not encounter any accidents. Hedgehogs are very inquisitive little creatures. Oftentimes, they tend to munch on their new beddings in order to satisfy their curious minds. Bedding materials such as pine wood shavings or fleece are safe for them to munch on, as long as they do it in small amounts only. When you buy new beddings, check its composition and make sure that they are not infused with any chemicals that might harm your pet. I hope that you had a fun time in perusing this article. The next step is to train your hedgehog. These animals are actually very smart and can be potty trained. With the right motivation, they can easily learn any trick that you teach them.